Netflix has been heavily investing in their original programming as of late, and the strategy is paying off. One of the cornerstones of their original programming has been reviving beloved shows that were canceled by other networks. One of the first and probably still the most popular example of this was Arrested Development season 4, which dropped on the streaming service back in 2013. Season 5 is still happening, but scheduling has been something of an issue. Supposedly, the production team has figured out an interesting and creative workaround for that; part of Arrested Development season 5 may be a prequel. TV Line broke the news that the long-awaited fifth season of the cult series will have a "major" prequel element, which would utilize different, younger actors for those scenes. Part of the problem, and probably the most significant problem, in getting Arrested Development season 5 going is working around the crazy schedules of the cast members, most of whom have very prominent careers outside of the show. This would certainly help alleviate some of those scheduling concerns, and the insider who spoke to TV line says it would allow for more scenes with all of the cast together. "More of the episodes can now include all of the original cast together, with lots of big group family scenes." 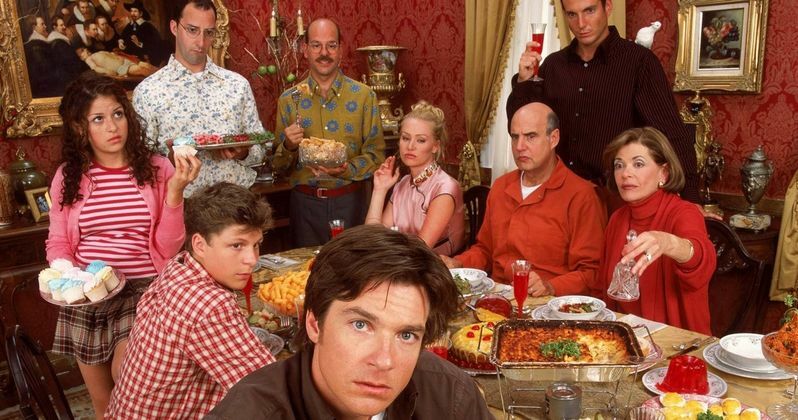 Fans of the series, which aired for three seasons on Fox starting back in 2003, were very happy to have Arrested Development return for a fourth season on Netflix, but there were mixed feelings about the approach. Because of similar scheduling conflicts, Arrested Development season 4 focused heavily on standalone character episodes, which didn't land with everyone who watched it. Exploring younger versions of the Bluth family is a unique way to work around the problem and could lend itself to some very funny storytelling, if fans can accept other actors in those roles. Netflix hasn't made any kind of official report in regards to Arrested Development season 5, only that they are definitely hoping to make it. So, they haven't substantiated this report in any way. However, producer Brian Grazer recently spoke a bit about the show at the TCA's and his comments seemed to back up TV Line's report. Here is what he had to say about it. "We are close... I think we found a way to create the compensation structure for all the actors and create a work matrix so they can still make movies and do other things and it will all integrate. So we are really close - I think within a couple of weeks at the most." Since Netflix has been dumping money into their original programming over the past couple of years, the compensation was probably never the main issue, so it is doubtful that would get in the way of Arrested Development season 5 happening. Getting Michael Cera, Jason Bateman, Will Arnett, Tony Hale, David Cros, Jessica Walter and Jeffrey Tambor in the same room at the same time, on the other hand, is tricky. Using a prequel format for Arrested Development season 5 could make that much easier since there will be less demand on their schedules, so even though this hasn't been confirmed, it seems like a viable option. We'll have to wait and see how it shakes out, but if Brian Grazer's timeline is right, we could be getting some sort of official word very soon.